The U.S. Patent and Trademark Office on Tuesday granted Apple three patents covering laser-based positional and 3D mapping hardware, a keyboard with mechanical switches and capacitive touch sensitive keys, and optical interconnect technology . Apple's U.S. Patent No. 9,456,307 for an "Electronic device with mapping circuitry" describes a portable system in which data from a laser sensor and positioning circuitry —GPS, accelerometer and gyroscopic sensors —is combined to create an accurate depth map of a user's surroundings. Normal laser rangefinding instruments calculate distance using time of flight, or the time it takes a pulse of light to reflect off a surface and return to the capture sensor. Such hardware is limited to measuring the distance between a device and a single surface or object, requiring users to stand in specific locations and take multiple measurements to accurately calculate the volume or area of a given space. Further, conventional devices lack advanced capabilities like recreating virtual images of a surface or room. 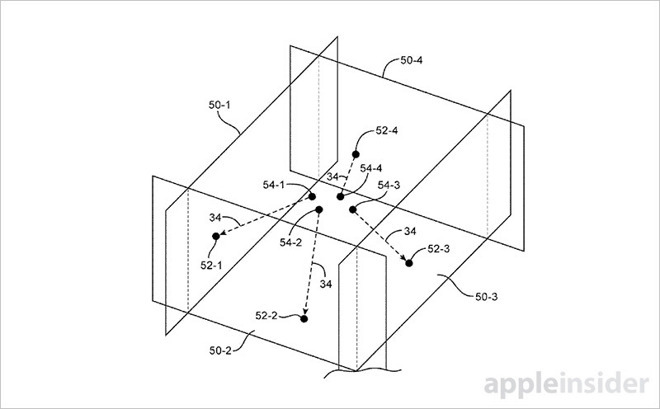 Like conventional measurement tools, Apple's implementation incorporates a laser sensor to gather sample data from multiple points, whether it be a flat wall or a complex object within a room. When a sample is triggered, positioning circuitry monitors the position and orientation of the test device, comparing it against previous samples to pinpoint the device's exact location in space. This allows the user to collect data while moving. The resulting data is then fed into a mapping application, which combines laser samples with positioning information to create an accurate composite of a target space. For example, the technology can be deployed in an iPhone to quickly generate virtual models of a room, complete with furniture and other miscellaneous objects. Though the technology might not be destined for the next iPhone, Apple could be looking at potential computer vision integrations for its Project Titan automotive initiative. Self-driving cars operate in part by "seeing" the road and surrounding environment, a process that begins with adequate hardware. Alternatively, Apple could easily apply the tech to its in-house mapping efforts, perhaps as a means to collect, digest and recreate environments for indoor maps. Apple's laser mapping patent was first filed for in May 2013 and credits Vivek Katiyar, Andrzej T. Baranski, Dhaval N. Shah and Stephen Brian Lynch as its inventors. Apple is continuing research into vanilla input hardware, as evidenced by the company's U.S. Patent No. 9,454,239 for "Enabling touch events on a touch sensitive mechanical keyboard." 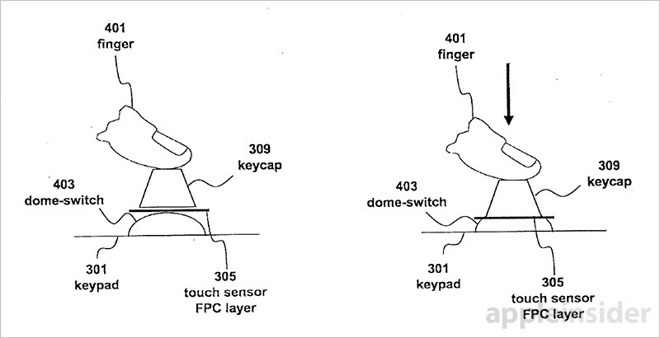 As suggested by its title, the patent details a mechanical keyboard capable of accepting both key strokes through physical depressible switches, and touch events via capacitive sensing areas disposed on key surfaces. Like conventional keyboards Apple's invention handles text entry with physical dome switches placed under each key. Touch sensitive elements installed on some key caps —or all in certain embodiments —detect taps, slides and hover events, granting users access to cursor controls without moving their hands to a trackpad. Software is used to distinguish touch events from mechanical key strokes. Some embodiments rely on time thresholds to determine user intent, while others rely on force exerted on the dome switch. Still others combine time, touch and force data to accomplish the same feat. Though slightly less advanced than the solution described in today's patent, Apple is widely rumored to integrate an OLED strip called the "Dynamic Function Row" in its upcoming MacBook Pro refresh. Taking the place of standard function keys, the OLED unit is believed to be highly customizable, meaning developers can take advantage of the hardware to display app-specific commands and information. 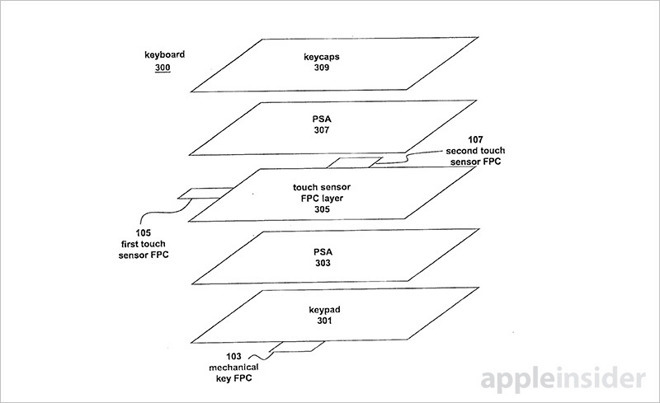 Apple first applied for its hybrid mechanical/touch sensitive keyboard patent in September 2011, and credits John Greer Elias as its inventor. 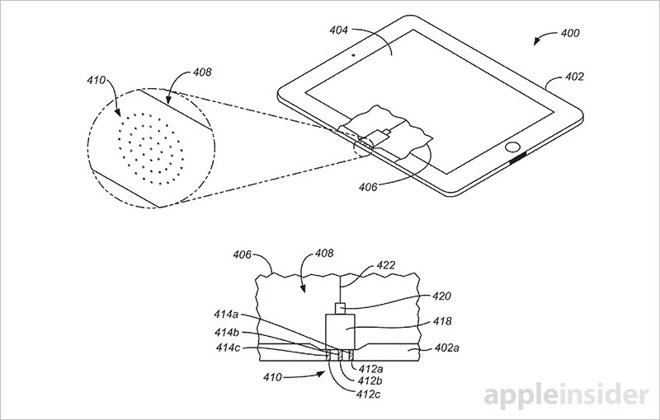 Moving back to laser technology, Apple's U.S. Patent No. 9,453,976 for an "Optical connector" details what appears to be an alternative to the Smart Connector format currently deployed with iPad Pro. As described, a portable device like an iPad or iPhone can be mated to another electronic device or accessory via a variety of hardware connections. Carrying the iPad Pro example forward, users can connect Apple's Smart Keyboard using the provided Smart Connector protocol. However, such solutions might be considered unsightly due to their reliance on exposed electrical contacts. In its patent, Apple proposes eschewing the wired connection for a solution that hides an optical interface behind micro-perforations that are all but invisible to the naked eye. Similar to other optical data transfer techniques, Apple's invention uses IC components to convert electrical signals into light, which is transmitted through a lens and the device's micro-perforations to a waiting mated peripheral. Instead of LED modules, however, Apple says infrared laser transmitters make for an ideal solution. Aside from looks, the laser light option consumes less power than wireless surrogates like Bluetooth and Wi-Fi. Though Apple already employs micro-perforation technology in its products, namely the sleep indicator on certain MacBook models, it is highly unlikely that the company will replace its Smart Connector protocol with optical technology. Aside from data bandwidth restrictions, an optical solution is unable to transfer power to and from attached accessories, a major selling point for Smart Connector. Apple's infrared laser connector patent was first filed for in January 2015 and credits Amy Qian, Derek W. Wright and John Raff as its inventors.